Because it’s tomato season, I’m including this book review at Willow House as well as at Willow Books, where it also appears. It’s a very interesting read, well worth checking out! Tomatoland by Barry Estabrook. Andrews McMeel Publishing, 2011. As someone who has purchased winter tomatoes here in the snowy north just for the sake of a little colour on the plate, I was interested in learning where those tasteless orbs come from and at what cost. The answer for many tomatoes is that they come from Florida, Estabrook’s Tomatoland, and the cost to workers and the environment is considerable. Tomatoland is a thorough exploration of the tomato business, written in a clear and well-organized manner that covers pretty much every aspect of the topic imaginable. I especially enjoyed the many portraits Estabrook offers of the people he interviews, everyone from farm owners to field workers to university researchers. They really bring the narrative to life. Estabrook first looks at the tomato itself and offers a little bit of history about this favorite fruit. You would think that there is plenty of variety available in heirloom tomatoes, big ones and small ones, orange ones and green striped ones, but when it comes right down to it, these plants are all closely related and represent less than 5 per cent of the genes of wild tomato species. Those genes that could be used to improve cultivated tomatoes are being lost through the ever-expanding habitat loss and degradation that lead to species extinction. Tomatoes are not a crop well-suited to the sandy soil and humid environment of Florida. What makes Florida a tomato centre is its proximity to the population centres of the eastern seaboard where an out-of-season winter tomato is welcomed with open wallet. It was in 1880 that Joel Hendrix first shipped green tomatoes to New York City and led the way for the development of the Florida tomato industry. To produce tomatoes in an inhospitable environment, the soil is first treated with methyl bromide to kill nematodes. Methyl bromide is a potent poison and its use contributes to the depletion of the ozone layer, and its use was supposed to have been phased out. However, Florida growers have been granted a ‘critical use exemption’. Its alternative, methyl iodide, is a carcinogenic known to be one of the most toxic compounds employed in chemical manufacturing. From this beginning a toxic brew of chemical fertilizers and pesticides is added. Many of these chemicals are still on tomatoes when they reach the market. Tomatoes are picked as ‘mature greens’ and exposed to ethylene in gassing chambers to ‘degreen’ them. Workers who labour in the tomato fields are exposed to these chemicals daily. Laws limiting worker exposure to pesticides are poorly enforced. Most are illegal migrant labourers who work for minimum wage and receive virtually no legal protection. Many live in seriously sub-standard housing. Land owners distance themselves from labourers by hiring middlemen, crew leaders who oversee workers and pay out wages. This opens the system to an array of abuses, the worst being slavery. Human traffickers enslave workers by entrapping them in a web of debt, charging monstrous rates for housing and food and then withholding wages until the ‘debt’ is paid. Enslaved workers are locked up between work days and threatened with violence against themselves or their families. The conviction rate against traffickers who practise this highly profitable racket is very low. The question the consumer who buys the end product may ask is why are these tomatoes so flavourless? The answer is that decades of research have all been directed at meeting the producers’ requirements and taste is not important. What makes for good taste anyway? Estabrook turns to researchers at the University of Florida for insight. Taste, it seems, is a complicated thing, a combination of sugars and acids and the trace chemicals (volatiles) you can smell. I found the discussion of taste and the research that the search for a tastier tomato has engendered very interesting. Estabrook also looks at alternatives to the status quo, from organic farming to better housing for workers. 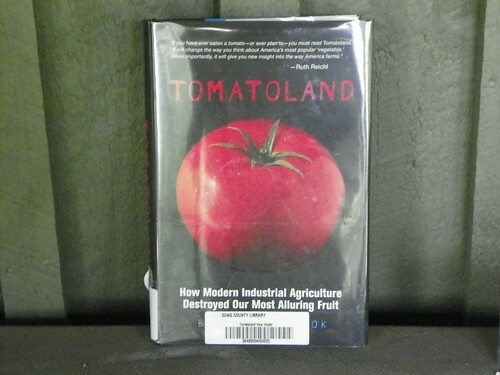 Tomatoland is a must-read for tomato lovers and highly recommended for any one interested in the inside story of industrial food production. It’s a little baffling, because tomatoes seem so easy to grow. Doesn’t seem like you should need the kind of chemical warfare that other crops require for Big Ag circumstances. They were the only thing in my garden this year that was untouched by either slugs or rabbits this year, survived our drought period with minimal watering compared to my other plants, and are producing on time in spite of my poor soil and lack of attention. I want to try bringing in one of my cherry tomato plants this winter, put it in a sunny window and put my grow light on it with a timer. They’re supposed to keep producing as long as they have enough light. Thanks for your comment, Fiddlegirl! Yes, that point (tomatoes are easy to grow) is discussed at some length in the book. Seems the sandy soil offers little in the way of nutrients, but the humid climate promotes nematodes that attack the plant roots; so, the soil is sterilized to get rid of the nematodes and then injected with fertilizer to feed the plants. But you can get all the details in the book. It’s quite interesting. Good luck with your cherry tomato project! Good grief! It makes me glad that I’m not a tomato lover. I rarely buy them, and then, only when I can get the locally grown ones. Hi Louise! Buying local is always a good policy, though even the local tomatoes these days aren’t the old varieties I knew when I grew up. Trouble is, the more you learn about where are food comes from and how it is processed, the more items you want to cross off your menu! Well, that’s pretty eye-opening. Makes you start to wonder about all the other imported produce that lines the rest of the grocery store shelves, too. I mean, I think we’re all sort of aware at some level that a lot of pesticides are used to grow commercial crops, but not all that other stuff that’s going on. So why Florida and not one of the states west of it, I wonder? Or do all the southern states have sandy soils? There’s a hothouse in Manotick that produces tomatoes most of the year, and is stocked in our grocery store. If for some reason I’m wanting tomatoes in the off-season I try to buy theirs. Here’s an article on the Manotick hothouse. According to it, the only months they’re not harvesting tomatoes are January and February. As I say, it’s worth reading the book for all the details, but Florida has long been a leader in winter tomatoes because of its location close to big populations. California, apparently, is the centre of the tomato canning industry. Florida is now facing stiff competition from Mexican tomatoes and northern-grown hothouse tomatoes. Thanks for the link, Seabie! I just started reading this book this week! Funny to see it here. I haven’t gotten very far yet, but already I know I will think twice about ever eating a grocery store (restaurant?) tomato again! Hmmm – maybe I really should freeze some of the ‘maters I have on my counter…. Ellen, I’m not much of a preserver myself, but it does give one pause. I think I’ll be making more of an effort to freeze tomatoes this year too! I will definitely be picking this book up. Enooma, it’s an interesting book, I’m sure you’ll enjoy it. I would also recomment the movie, King Corn, if you can find a copy.